Last Thursday, November 1, two high-performance aircraft landed on a private airstrip in Placencia. According to information provided by KREM News, the planes were carrying wealthy Guatemalans who were to attend a wedding in Placencia. Reportedly, the passengers were also said to be highly ranked in the Guatemalan government. These flights were out of the ordinary for several reasons. While the flights were accommodated by Belizean authorities at Marco Caruso’s airstrip, it appears that the planes bypassed the Philip Goldson International Airport (PGIA) in Ladyville. There is still the possibility, however, that a waiver might have been obtained in order for the flights to land in Placencia instead of the PGIA. Another strange thing about the landing of the flights, though, is that other pilots were notified of the presence of the planes in local airspace solely by word of mouth, in order for them to avoid the aircraft. Still, according to KREM, the Immigration, Police and Customs Departments reportedly oversaw the movements of the planes, although the police only found out at the last minute. Lastly, the airstrip on which the planes landed was last officially used for the visit of Central American heads of state to Belize in December 2014, when the Central American Integration System (SICA) met in Placencia. During this meeting, Prime Minister Dean Barrow was present, along with former Guatemalan president Otto Perez Molina, as 13 accords on relations between Belize and Guatemala were signed. 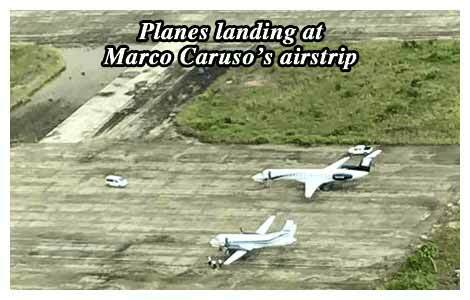 This seems to suggest that direct flights to the Marco Caruso’s airstrip are normally not allowed, except for extremely important events.